York City Football Club fans are being asked to share their memories of Bootham Crescent in a new project launched today Tuesday 7th August by Historic England to mark the last full season being played at the stadium, in order to gather ideas to help shape the proposed re-development of the site. City of York Council’s Executive confirmed Monks Cross as their preferred location for a new Community Stadium in July 2010. Construction of the new stadium is well underway and Bootham Crescent is due to be re-developed for housing. Historic England has commissioned Jason Wood, a heritage consultant specialising in the public history of sport and leisure – and football grounds in particular – to run the project. Fans and locals are urged to get in touch with Jason with their memories of the ground and ideas for its re-development – contact details below. The first home game of this last season will kick off of 19.45 on Tuesday 7th August. Jason will be at Bootham Crescent from 12 noon to film and conduct interviews in and around the ground and at half time during the match. 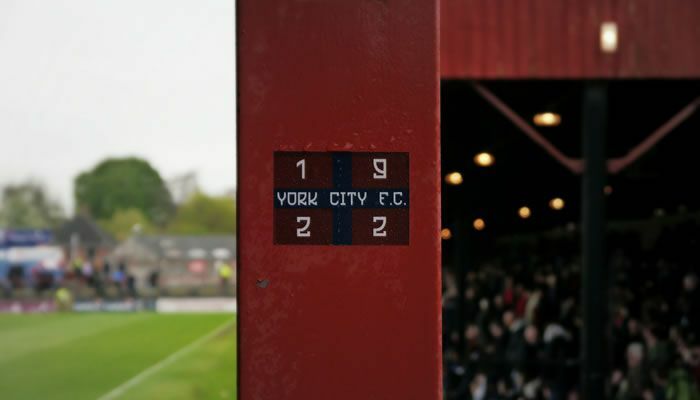 York City has been playing at Bootham Crescent since 1932 and bought the freehold of the ground in 1948. The ground holds great meaning for thousands of football fans but also for local businesses and residents who will experience a very different neighbourhood when the football team moves to Monks Cross. Historic England will explore what people value about the place and will consider how those memories might be captured for the future. The Club has already identified physical elements like plaques and monuments that will need to be carefully relocated. Understanding and reflecting the important heritage of Bootham Crescent will help to give the new development meaning and encourage surrounding communities feel better connected to it.